The SA538B is a large-diaphragm, multipattern tube condenser microphone, designed to provide a tonal contrast to the company’s flagship model, the SA538. Both mics use a 12AX7/ECC83-based tube amplifier circuit, with an external power supply providing pattern control from omni to figure-8 with 7 intermediate steps. Neither mic provides a pad or high-pass filter. Both use dual-diaphragm capsules (presumably 34mm) with 27mm diaphragms. Both mics follow CharterOak’s rigorous multi-step quality control and burn-in procedure, culminating in a half-hour of studio time with an experienced engineer to do a final usage inspection on each individual microphone. The SA538B uses an edge-terminated capsule design. Charter Oak imports capsule metalwork from a Chinese supplier, remachines the parts to ensure consistency, and then ships the parts back to China for diaphragm fitting and capsule assembly. Its noise rating is a bit better than the SA538, with an A-rated measure of 20dB. The average rating for this type of microphone (large-diaphragm tube condensers) is lower, around 16dBA for all the mics we’ve seen. 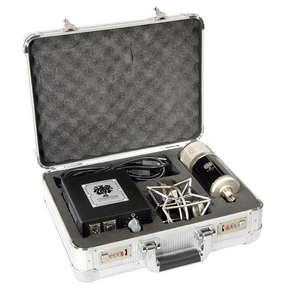 Like the SA538, the ‘B’ version ships with its tube power supply in a locking flight case with a shockmount and cables. The mic is covered by a lifetime warranty. I had to record some piano for a very sparse, weird arrangement where the overall tone was really going to affect the presentation… with the CharterOak in figure 8, on a big upright piano, a Sage electronics class A mic pre [the SE-PRE1], and a Pultec EQP1 I got one of the most amazingly detailed, forward, lifelike piano sounds I have ever recorded with any single microphone… The bottom of the piano was resonant and solid, the mids were insanely detailed, and the hammer/highs were simply perfect. The CharterOak Acoustic Devices SA538B is also known as: SA-538B. The mic was released in 2005.